A couple of weeks back, I looked at how Garry Trudeau used B.D.’s weekly check-in with his therapist Elias to talk about the Trump presidency and mental health. Donald Trump’s election may not have made us crazy, but, as B.D. and Elias show, for many people it underlined a feeling that nothing in the world feels right anymore, and brought into sharp focus a sharp sense of insecurity among those — women, immigrants, people of colour, LGBT people — who stand to lose the most in a nation ruled by Trump’s Republican Party. While B.D.’s role in recent years has been in large part to allow GBT to talk about the challenges veterans face, notably mental health issues, he’s not the first Doonesbury character to deal with mental illness. Leaving aside Duke’s “bad craziness,” Trudeau’s first engagements with mental health issues focused on two characters who represent some of the most marginalized people in our communities — the elderly homeless. On 6 August, Trudeau returned to the question of Trump and mental health when Alice and Elmont, homeless people who are probably in their eighties, dropped in on Mark’s radio show to talk health care. Full confession: a lot of what follows is from memory because I’m only up to 1977 in my reading of the strip, and much of what I’m talking about here took place in the 1980s and later. That said, Alice first appeared in 1973 as a regular in a pub where Zonker was tending bar. She was depicted as a sad woman, but a genuinely good and loving person who had built a community of people she loved, and who loved her. 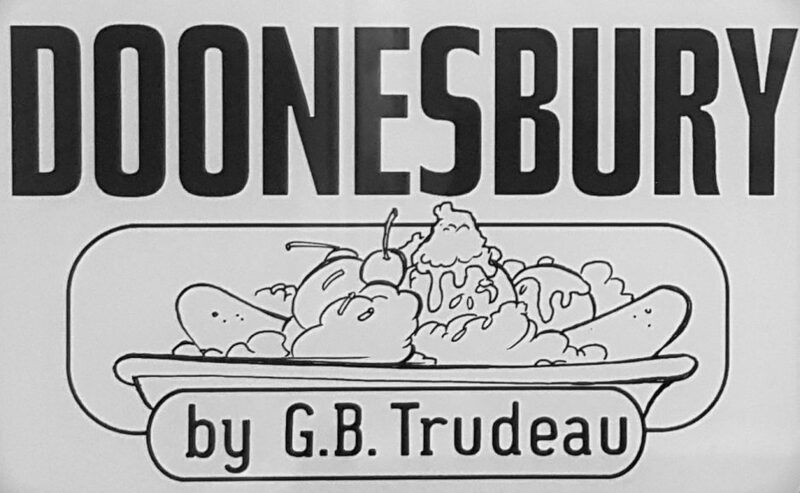 Doonesbury, 25 August 1973. An early appearance by Alice. At some point, she loses all of that. Alice reappears sometime in the 1980s as a homeless woman living in Washington DC. I’ll write more about Alice’s adventures on the streets and how she brought the realities of grinding abject poverty to the comics page later. What’s important here is that her situation reflected one of the most egregious failures in post-war American social policy. In the 1980’s, Ronald Reagan eviscerated government programs that promoted housing security and cut tax breaks that fostered the development of low-income homes: homelessness increased sharply as a result. Bad enough that Reaganomics caused a sharp climb in homelessness; in Reagan’s America, the homeless became a scapegoat. An emerging neoliberal consensus ruled that anyone could succeed if only they worked hard, and those who “fell between the cracks” were somehow deserving of their miserable situation. Looking back, it’s hard not to see Alice as someone who, in her earlier incarnation in the strip, struggled with severe depression. It’s easy to imagine that mental health struggles made it harder for Alice to keep up in Reagan’s America; with the HUD programs cut to the bone, there was nowhere left for her to go. GBT brought the relationship between mental health and homelessness into sharper focus when Alice met up with Elmont, a homeless man who suffers from severe mental illness, including delusions and paranoia. Ever since, Trudeau has used Alice and Elmont’s struggles and occasional small victories to chronicle the ways in which society continues to turn its back on those who, for whatever reason, can’t keep up. Doonesbury, 6 August 2017. Obamacare pays for EVERYTHING, Jack. Trudeau’s 6 August strip looks at the most pressing issue in American policymaking this year, healthcare. While millions of people who could not otherwise afford health insurance dodged a bullet in the time between GBT writing the strip and its publication, for many Americans, access to medical care is set to be a critical question for the foreseeable future. Mark’s conversation with Alice and Elmont reveals how, like in Reagan’s America, in Trump’s America the truly marginalized — people like the homeless and the mentally ill — will be forced to give up a little more of their security and well-being for the benefit of the wealthy and powerful. As is often the case, there is a nugget of critical truth in Elmont’s disjointed dialogue: a pre-existing addiction (…in this case to access to what literally every other person living in a modern industrial democracy knows he or she can rely on, basic health care) is a really hard thing to kick.